Nutritional Hybrid Technology - USANA Hepasil DTX utilizes USANA’s innovative Nutritional Hybrid Technology - an advanced approach to formula design and manufacture featuring bilayer tableting--the separation of various formula ingredients into two distinct tablet layers. Now, previously distinct products composed of incompatible ingredients can be combined into a single tablet. Key ingredients are separated into two visually distinct tablet layers. 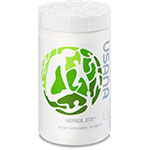 Proudly, USANA is among the first in the supplement world to use Nutritional Hybrid Technology. USANA’s Nutritional Hybrid Technology has opened the door to accelerated innovation in supplement design and manufacture.